This article gives an overview of our efforts in creating a platform for multi-agent based social simulation building on recent progress in the area of agent-oriented programming languages. The platform is called MAS-SOC, and the approach to building multi-agent based simulations with it includes the use of Jason, an interpreter for an extended version of AgentSpeak, and ELMS, a language for modelling environments where cognitive agents are situated. This article also mentions recent work on the use of ontologies in defining environments with ELMS and illustrates the approach with a simple example. After almost a decade during which research on agent-oriented programming struggled to deliver any concrete results, the last couple of years has seen an impressive improvement in the quality of research in the area, as well as a considerable increase in the number or researchers involved in it. This lead to the creation of two international workshop series on the subject (Bordini 2004b, Dastani 2004, Leite 2004b, 2004a). In this paper, we describe on going work that is aimed at using the recent developments in agent-oriented programming for developing a simulation platform, called MAS-SOC, which should be particularly suitable for the area of Social Simulation. This work draws on a series of papers where we contributed both to practical extensions of an agent-oriented programming language (Ancona 2004, Moreira 2004, Bordini 2002), as well as to its formal semantics (Bordini 2002, Moreira 2002, Vieira 2005). The variety of agent-programming languages and supporting tools now widely discussed in the literature are aimed particularly to support the ever increasing transfer of multi-agent systems technologies to Industry (see, e.g., the special section on the "Industrial Uptake of Agent Technology" in issue 16 of AgentLink News). However, if such languages are to effectively improve the development of sophisticated industrial applications, it is likely they will have similar, if not greater, impact on the development of social simulations, where the notions of autonomous agents and multi-agent systems are known to have introduced major advantages. Whilst our approach draws on the progress of such programming languages, there are still a great deal of multi-agent systems techniques that need to be incorporated. In (Rodrigues 2003), a qualitative mechanism for regulating social exchange was presented; this is one of the techniques we plan to incorporate into our social simulation approach. Further, we still lack the means for specifying social structures explicitly (e.g., groups, organisations), which is very important for social simulation. To provide mechanisms for specifying such structures as part of a system of BDI agents is ongoing work; this is based particularly on the approach to organisations presented in (Hübner 2003). There is also ongoing work on integrating our BDI agents with Semantic Web technologies, such as ontologies (Staab 2004). This is important not only for Semantic Web applications, but also forGrid-based computing (Foster 2003), as Grid infrastructures are currently drawing heavily on such technologies. In the medium term, we plan to have our platform fully operational for Grid-based social simulations. One of our long term objectives is to introduce simulation mechanisms based on the conceptual reconciliation of cognition and emergence: this is particularly inspired by Castelfranchi's (2001,1998) idea that only social simulation with cognitive agents ("mind-based social simulations" as he calls it) will allow the study of agents' minds individually and the emerging collective actions, which co-evolve determining each other. In others words, we aim (in the long term) at providing the basic conditions for MAS-SOC to help in the study of a fundamental problem in the social sciences, which is of the greatest relevance in multi-agent systems as well: the micro-macro link problem (Conte 1995). The BDI architecture (Rao1995, 1991) and logics (Rao 1998, Singh 1999, Wooldridge 2000), on which the agent language used here (and various others among the existing agent-oriented programming platforms (Bordini 2004b)) is based, has the advantage, as a model for cognitive agents, as being the best known and most extensively studied one; further, it has in very recent years started to attract again considerable interest in the major agent conferences. Although MAS-SOC is a fully functional simulation platform, which was first described in (Bordini 2004c), not many experiments have as yet been conducted with it. A simple simulation to investigate social aspects of urban growth appeared in (Krafta 2003); it was completely developed in accordance with the various techniques which form the MAS-SOC approach to social simulation (Section 8 brings another sample simulation). Because there is little practical experience with the platform, we do not offer, in this paper, benchmarking results as was the case of other JASSS Forum articles. Instead, we introduce the various technical aspects of a platform which follows a paradigmatic change that we think will have a major impact in the future development of large-scale social simulations. In the next section, we give an overview of the whole MAS-SOC approach to multi-agent simulations. In the following sections, we describe each of the technologies that form the MAS-SOC platform. Towards the end, we present a simple example which shows how these various technologies are used and combined. One of the main goals of the MAS-SOC simulation platform (MAS-SOC stands for Multi-Agent Simulations for the SOCial Sciences) is to provide a framework for the creation of agent-based simulations which does not require too much experience in programming from users, yet allowing users to use state-of-the-art agent technologies. In particular, it should allow for the design and implementation of simulations with cognitive agents -- a plethora of platforms for reactive agents exists, but that is certainly not the case for more elaborate agents. In our approach, agents' reasoning is specified in a much extended version of AgentSpeak(L) (Rao1996), as interpreted by Jason, an Open Source agent platform based on Java (Bordini 2005). Of particular interest is that the extensions allow for speech-act based agent communication, and there is ongoing work to allow for ontologies as part of an AgentSpeak(L) agent's belief base. The environments where agents are to be situated are specified in ELMS, a language we have designed for the description of multi-agent environments(Okuyama 2005, 2003, Bordini 2004a). The development of an environment description language for our simulation platform was needed because when a multi-agent system is a (completely) computational system (i.e., not situated in the real world), this is an important level of the engineering of multi-agent systems. However, this level of agent-oriented software engineering is not normally addressed in the literature, as environments are simply considered as "given". This occurs in particular in relation to cognitive agents. 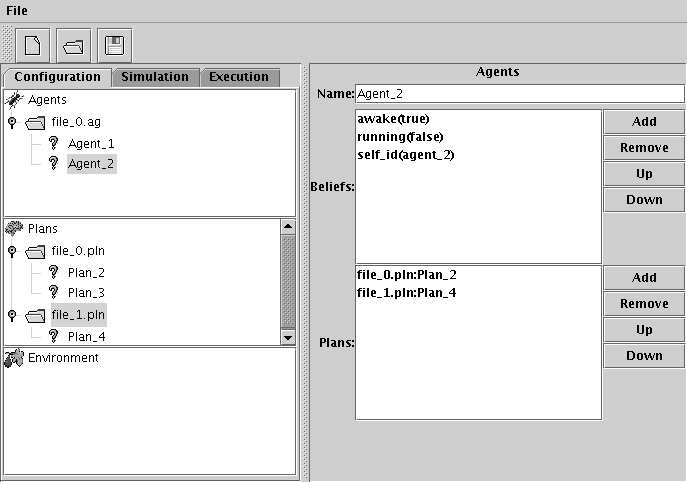 The interactions among the simulation components (agent-agent, agent-environment) are implemented with the SACI toolkit (Hübner2003). The communication and agent management infrastructure available with SACI makes it easy to run as systems distributed over the Internet. A graphical user interface is provided, which facilitates the specification of multi-agent environments, agents (their beliefs and plans), and multi-agent simulations; it also helps the management of libraries of these simulation components. From the information given by the user, the system generates source codes for the AgentSpeak(L) and ELMS interpreters, on which MAS-SOC is based. We now discuss each of the technologies associated with MAS-SOC in turn. The AgentSpeak(L) programming language was introduced by Rao in (1996). The language was quite influential in the definition of other agent-oriented programming languages. AgentSpeak(L) is particularly interesting, in comparison to other agent-oriented languages, in that it retains the most important aspects of the BDI-based planning systems on which it was based. Its relation to BDI logics (Rao 1998) has been thoroughly studied (Bordini 2002, 2004) and a working interpreter for the language (Bordini 2002) has been developed based on its formal operational semantics (Moreira 2002, Bordini 2004). AgentSpeak(L) integrates notions of the BDI architecture and logic programming, providing an elegant abstract framework for programming BDI agents. The BDI architecture is, in its turn, the predominant approach to the implementation of "intelligent" or "rational" agents (Wooldridge2000). Figure 1. Syntax of AgentSpeak(L). Figure 1 shows the abstract syntax of AgentSpeak(L). An AgentSpeak(L) agent is created by the specification of a set of base beliefs and a set of plans. The initial set of beliefs is just a collection of ground first order predicates. A plan is formed by a triggering event (denoting the purpose for that plan), followed by a conjunction of belief literals representing a context. The context must be a logical consequence of that agent's current beliefs for the plan to be applicable. The remainder of the plan is a sequence of basic actions or (sub)goals that the agent has to achieve (or test) when the plan, if applicable, is chosen for execution. AgentSpeak(L) distinguishes two types of goals: achievement goals and test goals. Achievement and test goals are predicates (as for beliefs) prefixed with operators `!' and `?' respectively. Achievement goals state that the agent wants to achieve a state of the world where the associated predicate is true. (In practice, these initiate the execution of subplans.) A test goal returns a unification for the associated predicate with one of the agent's beliefs; it fails otherwise. A triggering event defines which events may initiate the execution of a plan. An event can be internal, when a subgoal needs to be achieved, or external, when generated from belief updates as a result of perceiving the environment. There are two types of triggering events: those related to the addition (`+') and deletion (`-') of mental attitudes (beliefs or goals). Plans refer to the basic actions (represented by the metavariable in the grammar above) that an agent is able to perform on its environment. Such actions are also defined as first-order predicates, but with special predicate symbols (called action symbols) used to distinguish them from other predicates. Figure 2. Examples of AgentSpeak(L) plans. Figure 2 shows some examples of AgentSpeak(L) plans. They tell us that, when a concert is announced for artist A at venue V (so that, from perception of the environment, a belief concert(A,V) is added), then if this agent in fact likes artist A, then it will have the new goal of booking tickets for that concert. The second plan tells us that whenever this agent adopts the goal of booking tickets for A's performance at V, if it is the case that the telephone is not busy, then it can execute a plan consisting of performing the basic action call(V) (assuming that making a phone call is an atomic action that the agent can perform) followed by a certain protocol for booking tickets (indicated by ` '), which in this case ends with the execution of a plan for choosing the seats for such performance at that particular venue. For AgentSpeak(L) to be useful in practice, various extensions to it have been proposed (Moreira 2004, Ancona 2004, Bordini 2002). In particular, the formal semantics for speech act-based communication primitives given in (Moreira 2004) formed the basis for the implementation of the open source interpreter Jason (Bordini 2005). Through speech act-based communication, an agent can share its internal state (beliefs, desires, intentions) with other agents, as well as it can influence other agents' states. Speech-act based communication for AgentSpeak(L) agents has already been used, in a very simple way, so as to allow model checking (Bordini 2003b, 2003a). Despite the considerable improvement that has been achieved since the paradigm was first thought out (Shoham 1993), agent-oriented programming languages are still in their early stages of development. Industrial-strength applications usually require massive use of data, thus a belief base that is simply an unstructured collection of ground predicates is just not good enough. Another shortfall of AgentSpeak(L), that reduces its applicability for the development of semantic web multi-agent systems, is the absence of mechanisms to indicate the ontologies that have to be considered by agents in their reasoning. This shortfall imposes the assumption (adopted in (Moreira 2004), for instance) that all communicating AgentSpeak(L) agents in a multi-agent application have a common understanding about terms that are used in the content of exchanged messages. This is clearly unrealistic for semantic web applications as they typically require the integration of multiple ontologies about different domains. 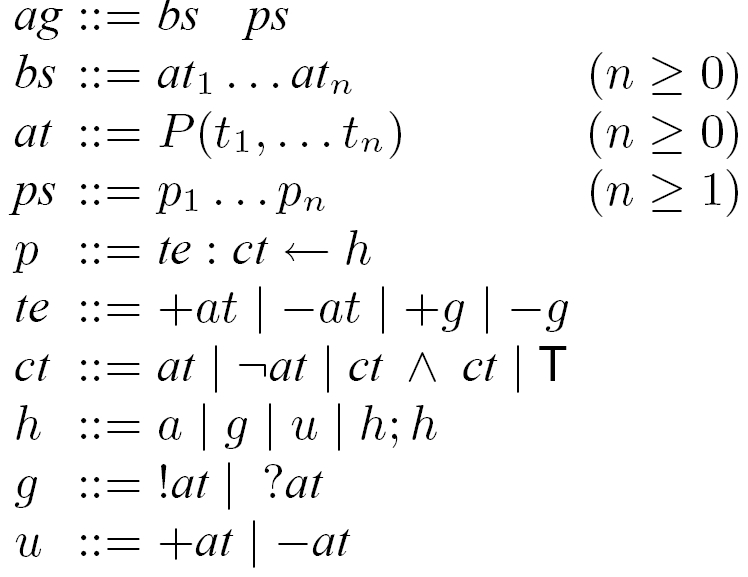 In order to overcome these limitations in the language we plan to improve the semantics of AgentSpeak(L) by first replacing the subset of predicate logic that is currently its subjacent logic, by more expressive Description Logics such as those of OWL DL and OWL Lite (Horrocks 2003). The idea is to allow AgentSpeak(L) agents to reason about ontologies written in OWL. This way, applications written in AgentSpeak(L) can be deployed on the Web and interoperate with other semantic web applications based on OWL, a W3C standard. Jason is the interpreter for our extended version of AgentSpeak(L), which allows agents to be distributed over the net through the use of SACI (Hübner 2003). Jason is available Open Source under GNU LGPL at http://jason.sourceforge.net (Bordini 2005). One of the important characteristics of Jason is that, as we mentioned above, it implements the operational semantics of an extension of AgentSpeak(L). Having formal semantics also allowed us to give precise definitions for practical notions of beliefs, desires, and intentions in relation to running AgentSpeak(L) agents, which in turn underlies the work on formal verification of AgentSpeak(L) programs. The formal semantics, using structural operational semantics (Plotkin 1981) (a widely-used notation for giving semantics to programming languages) was given then improved and extended in a series of papers (Moreira 2002, 2004, Bordini 2002, 2004, Vieira 2005). However, for space limitation, we are not able to include a formal account of the semantics of AgentSpeak(L) here, so we will just provide the main intuitions behind the interpretation of AgentSpeak(L) programs. Besides the belief base and the plan library, the interpreter also manages a set of events and a set of intentions, and its functioning requires three selection functions. The event selection function ( ) selects a single event from the set of events; another selection function ( ) selects an "option" (i.e., an applicable plan) from a set of applicable plans; and a third selection function ( ) selects one particular intention from the set of intentions. The selection functions are supposed to be agent-specific, in the sense that they should make selections based on an agent's characteristics (though previous work on AgentSpeak(L) did not elaborate on how designers specify such functions. Therefore, we here leave the selection functions undefined, however the choices made by them are supposed to be non-deterministic. Intentions are particular courses of actions to which an agent has committed in order to handle certain events. Each intention is a stack of partially instantiated plans. Events, which may start off the execution of plans that have relevant triggering events, can be external, when originating from perception of the agent's environment (i.e., addition and deletion of beliefs based on perception are external events); or internal, when generated from the agent's own execution of a plan (i.e., a subgoal in a plan generates an event of type "addition of achievement goal"). In the latter case, the event is accompanied with the intention which generated it (as the plan chosen for that event will be pushed on top of that intention). External events create new intentions, representing separate focuses of attention for the agent's acting on the environment. A provision exists for internal events corresponding to plan controlled update of beliefs, necessary to support limited form of plan controlled register of deductions performed. We next give some more details on the functioning of an AgentSpeak(L) interpreter, which is clearly depicted in Figure 3 (reproduced from (Machado 2002)). In the figure, sets (of beliefs, events, plans, and intentions) are represented as rectangles. Diamonds represent selection (of one element from a set). Circles represent some of the processing involved in the interpretation of AgentSpeak(L) programs. At every interpretation cycle of an agent program, the interpreter updates a list of events, which may be generated from perception of the environment, or from the execution of intentions (when subgoals are specified in the body of plans). Beliefs are either updated from perception or from plan controlled operations (the latter is not shown in 3) and whenever there are changes in the agent's beliefs, this implies the insertion of an event in the set of events. This belief revision function is also supposed to be agent specific. Figure 3. An Interpretation Cycle of an AgentSpeak Program (Machado 2002). After has selected an event, the interpreter has to unify that event with triggering events in the heads of plans. This generates a set of all relevant plans. By checking whether the context part of the plans in that set follow from the agent's beliefs, the interpreter determines a set of applicable plans (plans that can actually be used at that moment for handling the chosen event). Then chooses a single applicable plan from that set, which becomes the intended plan for handling that event, and either pushes that plan on the top of an existing intention (if the event was an internal one), or creates a new intention in the set of intentions (if the event was external, i.e., generated from a perception of the environment). All that remains to be done at this stage is to select a single intention to be executed in that cycle. The function selects one of the agent's intentions (i.e., one of the independent stacks of partially instantiated plans within the set of intentions). On the top of that stack there is a plan, and the formula in the beginning of its body is taken for execution. This implies that either a basic action is performed by the agent on its environment, an internal event is generated (in the case that the selected formula is an achievement goal), or a test goal is performed (which means that the set of beliefs has to be checked). If the intention is to perform a basic action or a test goal, the set of intentions needs to be updated. In the case of a test goal, the belief base will be searched for a belief atom that unifies with the predicate in the test goal. If that search succeeds, further variable instantiation will occur in the partially instantiated plan which contained that test goal (and the test goal itself is removed from the intention from which it was taken). In the case where a basic action is selected, the necessary updating of the set of intentions is simply to remove that action from the intention (the interpreter informs to the agent effectors what action is required). When all formulæ in the body of a plan have been removed (i.e., have been executed), the whole plan is removed from the intention, and so is the achievement goal that generated it (if that was the case). This ends a cycle of execution, and everything is repeated all over again, initially checking the state of the environment after agents have acted upon it, then generating the relevant events, and so forth. 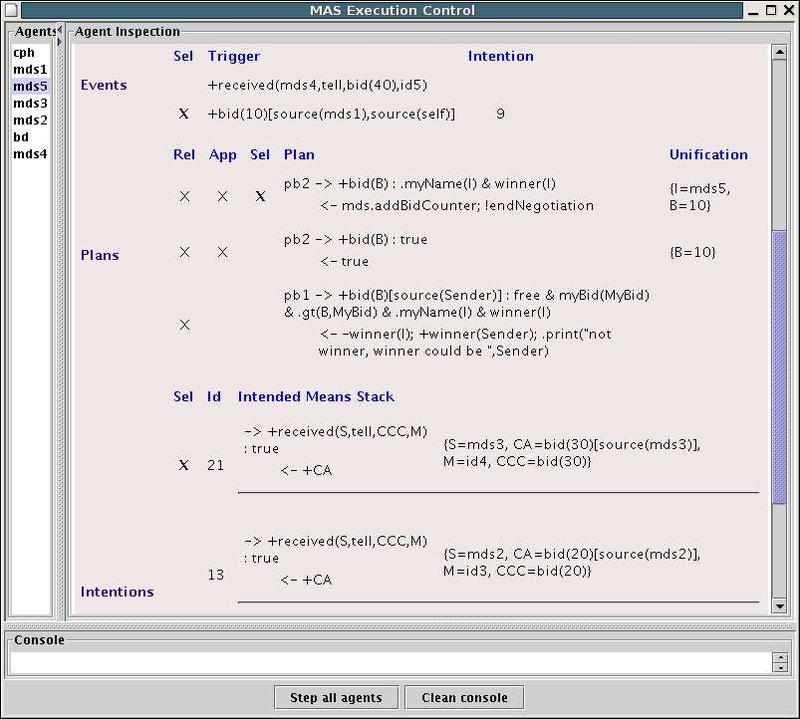 Jason is distributed with an Integrated Development Environment (IDE) which provides a GUI for editing AgentSpeak code for the individual agents (see Figure 4). Through the IDE, it also possible to control the execution of a MAS. There is another tool provided as part of the IDE which allows the user to inspect the agents' internal states when the system is running in debugging mode (see Figure 5). This is very useful for debugging MAS, as it allows "inspection of agents' minds" across a distributed system. Figure 5. Jason "Mind Inspector" Tool. Interestingly, most of the advanced features are available as optional, customisable mechanisms. Thus, because the AgentSpeak(L)core that is interpreted by Jason is very simple and elegant, yet having all the main elements for expressing reactive planning system with BDI notions, we think that Jason is also ideal for teaching AOP for under- and post-graduate studies. This section introduces the main aspects of the language we defined for the specification of the simulated environment that is to be shared by the agents in a multi-agent simulations. The language is called ELMS (Environment Description Language for Multi-Agent Simulation). Besides the basic environment properties and objects, the language provides the means for the specification of the "physical" part of simulated agents, which we refer to as the "bodies" of the agents, as well as the various kinds of physical interactions, through actions and perceptions that may happen between agents and objects, including other agents in the environment. We have developed a prototype of an interpreter for an environment definition language, presented in detail in (Okuyama 2003) and also in (Bordini 2004a, Okuyama 2005). MODELLING ENVIRONMENTS WITH ELMS: An environment description is a specification of the properties and behaviour of the environment objects. In our approach, we also include in such specification the definition of the features of the simulated "bodies" of the agents. The modelling of such "physical" aspects of an agent (or agent class, more precisely) includes the definitions of its properties that may be perceived by others agents, the definitions of the kinds of perceptions that are available for that agent, and the actions that the agent is able to perform in the environment. The definition of the environment includes mainly sets of: objects, to which we interchangeably refer as resources of the environment; reactions that objects display when agent actions affect them; an (optional) grid to allow the explicit handling of the spatial positioning of agents and objects in the environment; and the properties of the environment to which external observers (e.g., the users) have access. The objects that are part of an environment can be modelled as a set of properties and a set of actions that characterise the object's behaviour in response to stimuli. That is, objects can react--only agents are pro-active. Agents can be considered components of the environment insofar as, from the point of view of one agent, any other agent is a special component of the environment (however, only certain properties of an agent can be perceived by other agents, and this must be specified by designers of agent-based simulations). Thus, to define agents from this point of view, it is necessary to list all properties that define the perceptible aspects of their bodies, a list of actions that they are able to execute (pro-actively), and a list of the types of perception to which they have access. From the point of view of the environment, the deliberative activities of an agent are not relevant, since they are internal to the agent, i.e., they are not observable to the other agents in the environment. As mentioned before, in the MAS-SOC approach the mental aspects of agents are described with the AgentSpeak(L) language. Quite frequently, spatial aspects of the environment are modelled in agent simulations by means of a grid. Our approach provides a number of features for dealing with grids, if the designer of the environment chooses to have one. In the constructs that make reference to the grid, positions can be accessed by absolute or relative coordinates. Relative coordinates are prefixed by ` 'and ` ' signs, so , for example, refers to the position at the upper right diagonal from the agent's current position. However, the grid definition is optional, as some simulations may not require any spatial representation. Clearly, there are simulations where the topology resulting from specific types of agent and object positioning is the main issue of interest for the investigation for which the simulations are being used. In contrast, there are also simulations where the existence of a topology is not relevant at all as, e.g., in a stock market simulation, where the main issue under consideration relate to the agent interactions themselves, and perhaps agents' interactions with some types of resources. In order to make ELMS as general as possible, we chose to make the grid an optional feature. For the definition of the types of perception to which each agent class has access, it is necessary to define which properties of the environment, agent bodies, and objects are to be perceived. The conditions associated with each perceptible property can be specified as well. That is, environment designers can control: which properties of objects will be accessible to the "minds" of the agents that are given access to a certain perception type, and under which conditions each (potentially perceivable) property will be effectively perceived. An action is defined as a sequence of changes in properties (of the environment in general, its resources, or agents) that it causes, along with the preconditions that must be satisfied for the action to be actually executed in the environment. Note that our approach allows for quite flexible environment definitions. It is the environment designer who decides which properties of the environment can be perceptible by agents, and which are observable by external users (as well as defining how actions change the environment). Any properties associated with objects or with agents themselves can potentially be specified as perceptible/observable properties. LANGUAGE CONSTRUCTS IN ELMS: The ELMS language uses an XML syntax, which can be somewhat cumbersome to be handled directly. However, recall that environment specifications are to be obtained from a graphical interface, so users do not need to bother about the language syntax. The main types of ELMS constructs are listed below. This construct defines a class of agent bodies for the agents that may join a simulation within that environment. A specification of an agent-body class contains its name, a list of attributes, a list of actions, a list of perception types, and a optional "constructor" procedure that is executed when the "agent body" instance is created. The list of attributes is defined as before; it characterises the observable properties of this class of agent bodies, from the point of view of the environment and other agents. It is then necessary to specify a list of names for the actions that agents of this type are able to perform in the environment. The set of perceptions is a list of the names of perception types (see below) that are available to agents of this class (i.e., the information that will be accessible to the agent's mind at every reasoning cycle). The code sample below define an agent-body class named consumer which has five integer attributes, one of them initialised with a random value from 60 to 100. Agents defined in this class are able to execute three types of perception, which will be explained later, and six types of actions. The constructor bellow places the agent in a random cell where the preconditions are true, the cell must not be a shop and may not have a owner already. After the placement, some values are set so that to the agent is defined as the owner of that cell. This construct allows the specification of perception types to be listed in agent-body specifications. A perception type definition is formed by a name, an optional list of preconditions, and a list of properties that are perceptible. The listed properties can be any of those associated with the definitions of resources, agents, cells of the grid, or simulation control variables. If all the preconditions (e.g., whether the agent is located on a specific position of the grid) are satisfied, then the values of those properties will be made available to the agent's reasoner as the result of its perception of the environment. With this construct, the actions that may appear in agent-body definitions are described. An action definition includes its name, an optional list of parameters, an optional list of preconditions, and a sequence of commands which determine what changes in the environment the action causes. The list of parameters specifies the data that will be received from the agent for further guiding the execution of that type of action. The possible commands for defining the consequences of executing an action are assignments of values to attributes (i.e., properties of agents, resources, etc. ), and allocations or repositioning of instances of agents or resources within the grid. Resources can also be instantiated or removed by commands in an action. If the preconditions are all satisfied, then all the commands in the sequence of commands will be executed, changing the environment accordingly. To avoid consistency problems, actions are executed atomically. For this reason, they should be defined so as to follow the concept of an atomic action (although this is again not mandatory); recall that more complex courses of actions are meant to be part of the agents' internal reasoning. In the example above, an action named rest is defined. It has no parameters, but the agent must be on his home cell as defined as a precondition for the action be executed, otherwise the action will fail. If the precondition is satisfied the stamina attribute will receive a random value between 60 and 100 units. This is used for a grid definition, if the designer has chosen to have one. The grid can be two or three dimensional, the parameters being the sizes of the grid on the X, Y, and Z axes. Still within the grid definition, a list of cell attributes can be given: the attributes defined here will be replicated for each cell of the grid. Also as part of the cell definition, a list of reactions can be defined for them. The code below exemplifies a definition of a two-dimensional grid that has ten columns and ten lines, where each cell has an integer that represents its owner (where means no owner) and a boolean variable that keeps the information about whether the cell is a shop or not. In this example, grid cells do not have reactions. This construct is used to define the objects in an environment (i.e., all the entities of the environment that are not pro-active). A definition of a resource class includes the class name, a list of attributes, and a set of reactions. The attributes are defined in the same way as for the cell attributes (i.e., by the specification of its name, type, and initial value). The reactions that a class of resources can have is given by a list of the names identifying those reactions. The resource definition is quite similar to the agent definition, the main difference being that the resources have reactions instead of actions. This part of the specification is where the possible reactions of the objects in the environment are defined. For each type of reaction, its name, a list of preconditions, and a sequence of commands is given. The commands are exactly as described above for actions. All expressions in the list of preconditions must be satisfied for the reaction to take place. Differently from actions, where only one action (per agent) is performed, all reactions that satisfy their preconditions will be executed "simultaneously" (i.e. in the same simulation cycle). There are some operational aspects of the simulations defined through other language constructs not mentioned here. To more details see (Okuyama 2005, 2003). RUNNING ELMS ENVIRONMENTS: The simulation of the environment itself is done by a process that controls the access and changes made to the data structure that represents the environment (in fact, only that process can access the data structure); the process is called the environment controller. The data structure that represents the environment is generated by the ELMS interpreter for a specification in ELMS given as input. In each simulation cycle, the environment controller sends to all agents currently taking part in the simulation the percepts to which they have access (as specified in ELMS). Perception is transmitted in messages as a list of ground logical facts. After sending perception, the process waits for the actions that the agents have chosen to perform in that simulation cycle. if the step counter has not yet reached the maximum value defined by the user, go to the step 2. Note that this corresponds to the (default) synchronous simulationmode. An asynchronous mode is also available. SOME REMARKS ON ELMS: In Russel and Norvig (2003), the authors define a number of characteristics that can be used to classify environments is given. We refer to those classifications below so that we can characterise the classes of environments that can be defined with ELMS. Using the ELMS approach, agents have access only to the environment properties that the simulation designer has chosen to make perceptible to them. Thus, making an ELMS environment fully or partially observable is a designer's decision. As ELMS environments can be only partially observable, and given that there are multiple agents that can change the environment simultaneously, from the point of view of an agent, an ELMS environment can appear to be stochastic. In ELMS environments, the current state is a consequence of the previous one and the actions taken by the agents in it. With cognitive agents, past actions may influence future actions, so each simulation cycle is unlikely to be just an isolated episode of perceiving and acting (although it is possible to use this approach for simple reactive agents, this is not what its intended use). An ELMS environment is meant to be shared by multiple agents. As various agents can act on this environment, an agent's action may disable another agent's action. Thus, from the point of view of agents, the environment can seem dynamic. ELMS environments tend to be discrete, through the use of a grid to represent a physical space, although this is not compulsory. To summarise, ELMS can be used to specify environments that are (from the point of view of the agents): partially observable, stochastic, sequential, and dynamic; however, they are usually discrete. This class of environments is the most complex and comprehensive, except for the class of environments that are continuous besides all that. However, continuous environments are notoriously difficult to simulate; although ELMS does not prevent that, it does not give much support in that respect either. We believe that ELMS allows the definition of rather complex environments, supporting a wide range of multi-agent applications (in particular, but not exclusively, for social simulation). There are many possibilities to evolve the work of environmental description with the ELMS language. We are still developing it through the aggregation of more complex language constructs, to ease the description of environments. Another possibility on development, is the replacement of the input language by a restricted set from the OWL language, what will open many other possibilities to use the structure that we developed for the environment description and execution, as will be presented on Section 6. Although the ELMS interpreter was been tailored for social simulation implemented according to the MAS-SOC approach, it could potentially be useful for other applications as well. An extension of our work above is a top level ontology for specifying environments, through which a project-level, executable definition of a multi-agent environment can be derived. Ontologies are known to be useful in many communication situations: between people, between people and systems, and also between systems themselves. In this work, the use of environment ontologies adds three important features to the existing platform/approach. First, ontologies provide a common vocabulary with which simulation developers can specify environments. The developing of social simulations usually depends on the work of a team with people from different areas, as social scientists and computer scientists. It is possible that those developing the agents are not the same working on the environments, interactions, and organisational schema. In such type of work small misunderstandings may compromise the whole process. An environment ontology presents a consensual model for an environment and agents; the essential properties of the environment and agents' actions and percepts must apply in all situations as defined by the semantic relationships between the elements of the environment, which will all be explicitly represented in the ontology. For this reason, we think that defining environments through ontologies aids the development of the simulation. Second, an environment ontology is useful for agents acting in the environment because it provides a common vocabulary for communication in and about the environment. Such explicit conceptualisation is also essential to allow interoperability of intelligent heterogeneous systems. Third, environment ontologies are defined through an ontology editor with a graphical user interface. This makes it easier for those unfamiliar with programming to understand and even design such ontologies. AN ONTOLOGY FOR ENVIRONMENTS IN MULTIAGENT SYSTEMS: We have defined a top-level ontology for environments that limits the possible constructs in an environment definition. The hierarchy of concepts related to our view of multi-agent environments can be seen in Figure 6. Table 1 shows the properties of the main concepts, and explains them briefly. Using an ontology editing tool (e.g., Protege), programmers can define their project environment on the basis of the predefined top ontology. Generating the project ontology can avoid various misunderstandings in all development stages from problem analysis to the specification that will be executed. For the agent programmers it will also be clearer how the environment works, which actions each agent is able to perform, and what it will receive as percepts. The programmer does not have to handle code directly, which usually has a semantics that is subjective. Consequently, the ontology also facilitates the understanding of the simulation and the validation of environment design. This editor generates an ontology representation in various formats; we work on the basis of the W3C standard, the Ontology Web Language (OWL). DERIVING AN ENVIRONMENT ONTOLOGY: We present an example of an environment ontology to illustrate our approach. The environment has shops and consumer's houses; the agents are shop owners, shopkeepers, and consumers; resources are products. 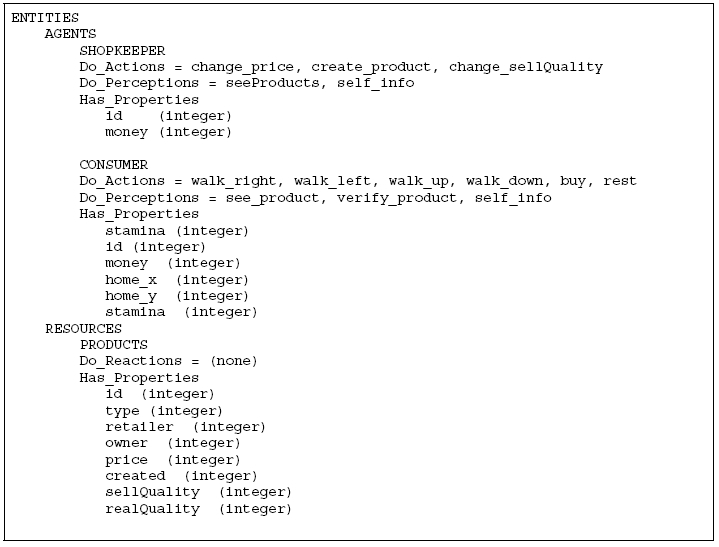 To implement this example, the designer derives the Agent class, creating the sub-classes of agents (Shopkeeper) and (Consumer); derive the Resource class creating classes such as Products instantiate the necessary resources; derive the Action, Perception and Reaction classes likewise as seen in the Figure 7. These are general steps to define an environment. The example in the figure shows the classes (in uppercase) and some of the properties of the classes derived from the top ontology to define the sample environment. The OWL ontology with the specific (derived) classes contains the information that is required to the ELMS interpreter for the generation of the environment controller process used in the simulation. A graphical user interface which facilitates the creation and running of simulations is being developed. This interface gives access to what we call the MAS-SOC manager. Besides facilitating the creation of simulations, the MAS-SOC manager integrates the various technologies used in our approach, such as the ELMS interpreter, the AgentSpeak(L) interpreter (Jason, see section 4), and the SACI infrastructure. The first aspect of the MAS-SOC manager that should be mentioned is related to the creation of libraries of plans, agents and environment (maintained in separate files), which facilitates the reuse of those definitions in different simulations. The MAS-SOC manager allows the creation and edition of each of these libraries. A file containing a plan library consists of a series of plan definitions in the AgentSpeak(L) syntax. In an agent library, each agent is represented by a name, a set of AgentSpeak(L) base beliefs (the initial beliefs that agents of this type will have when the simulation begins), and a list of pointers to plans (in fact, plan labels) in specific plan libraries. With this, the AgentSpeak(L) source codes for the agents can be generated by the interface and sent to the running instances of the AgentSpeak(L) interpreter. The information for an environment definition is also prompted from the graphical interface, and the MAS-SOC manager automatically generates the XML-based ELMS source code, which is sent to the ELMS interpreter. Figure 8 gives a flavour of the MAS-SOC user interface. It has the style of a "workspace", where one can create and edit libraries of plans, agents, and environments, which can then be used in defining a multi-agent simulation. Plans and agents follow the straightforward syntax of AgentSpeak(L), and all necessary information for an ELMS environment description if prompted via a form-like interface. Other features of the MAS-SOC manager are the creation, execution and monitoring of the simulation, which we are still improving. This part of the platform provides the integration of the several systems forming the MAS-SOC approach. Figure 8. MAS-SOC Manager GUI. In a simulation definition window of the user interface, the user determines the set of individual agents and the particular environment that are intended for a given simulation. From the environment definition, the MAS-SOC manager checks which types of agents can participate in the simulation, and allows the user to choose, for each of those types, the number of instances of individual agents that will be created (by means of the SACI toolkit). Each of these agents runs an AgentSpeak(L) interpreter with the source code generated by the MAS-SOC manager. After the user has informed the chosen environment and the instances of agents, the simulation can be started off. The execution of agents can aborted and new ones can be created through the MAS-SOC manager. An execution window then provides the information about the components of a simulation (agents and resources) which are active in a simulation. There are in fact two levels of information about agents: their internal and external states. The internal state gives information on an agent's mental attitudes (e.g., its present beliefs and intentions) at each simulation step, while its external state is related to the characteristics (properties) of the agent that are perceptible to other agents through the environment. These two levels of information on agents can be accessed separately from the execution window. For the resources, one can observe the current values associated with their properties (attributes). This is a simple example of a simulation that was built using our approach of multi-agent simulation. It will be presented briefly; see (Calcin 2004) for more details and some discussion on the design choices of the simulation. The simulation is composed by consumer agents, shopkeepers, and the environment were they interact. The objective of the consumers is to buy everything in their wish-list, paying a good price for good products. The objective of the shopkeepers is to increase their profit, selling their products and sometimes cheating consumers. THE ENVIRONMENT: The environment, as mentioned in section 5, is represented by a 10x10 grid, were each cell has a boolean attribute shop andan integer attribute owner which indicates the agent owner of the place. The shop cells are uniformly distributed in the environment, while the consumers' houses are randomly distributed in the free cells. For each shop there is a shopkeeper agent who offers for sale the products available in that cell. When a consumer agent enters a shop its perceptions will allow him to obtain information about all the products available in the shop. The perceptions include the product number, type, price, quality (we refer to it as sellQuality, defined by the shopkeeper, which can be different from the product's actual quality). The consumer's house is a cell owned by consumer agent which has the shop attribute set as false. The products bought by the consumers are stored on each consumer's house. When an agent enters on a consumer's house it will receive the complete information about the products present in that cell. This perception is composed of the same information about the products in the shop, but now it includes the product real quality and product retailer (shopkeeper ID). With this information the consumer agent will be able to evaluate which shopkeepers cheat and which do not. Each consumer agent has an amount of stamina (energy) used to walk through the grid looking for the products that it wants. For each cell move, the stamina is automatically decreased by 3 units (this is controlled by the environment). There is a class of resources named products that represents the items that a shopkeeper has to sell or that a consumer has bought. The definition of this resource is in the code sample below. THE CONSUMER AGENT: The consumer agent has as initial belief a list of products that it wants to buy, including information such as the expected quality and price of the products. During the simulation the agent accumulates information about where the products are available, the price and quality of desired products, and the level of confidence in each shopkeeper. When the consumer enters a shop, with the information received through perceptions, it will store the information about the products that are in the list of the consumer's desired products. When the consumer enters a house, it will receive the information about the products that the cell owner had bought; with this information the agent will evaluate the shopkeepers. The consumer will walk around the grid examining products in shops until its stamina level reaches some threshold, and then the agent will start buying the products that fulfilled the expectations. The agent will go to the shops where he saw the product with the best cost and quality, and will buy the product if the product is still available. When the consumer's stamina level reaches another threshold level, the agent will go home to rest. At the home cell, the consumer executes the rest action to have its stamina level restored. After buying all the items in the list, the agent will return to its home cell. this type of consumer has the lower stamina levels between 60 and 70. This means that this agent will do a shorter search for the products and prices. this type of consumer has a middle stamina level, between 75 and 85.
this type of consumer has the higher stamina level between 90 and 100. Agents of this type will do the longest search for the products and prices. As mentioned before, the agents reasoning is defined using the AgentSpeak(L) language. The following plan is executed when the consumer agent finds a product bought with a good price and quality. It is used to raise the evaluation of the shopkeeper who sold the product. THE SHOPKEEPER AGENT: The shopkeeper agent has to offer products in its shop. For each product that it creates, there is a cost proportional to the realQuality of the created product. The shopkeeper may choose to use any value as the sellQuality that will be presented to the consumer. If there is a big difference between the sellQuality and the realQuality, the consumers will start avoiding to buy from this shopkeeper. The shopkeeper may change the prices and the sellQuality of the products along the simulations, if it chooses to do so. As its products are sold, the agent needs to create new products to replace the ones that have been sold. this type of shopkeeper will sell its product with very little difference between the realQuality and the sellQuality. This means that this agent will not cheat the consumers, or will cheat seldom. this type of shopkeeper will try to cheat the consumers unless it does not sell any good during a number of cycles. SIMULATION RESULTS: For this simulation, 30 shopkeeper agents were instantiated and uniformly distributed in a grid, and 15 consumers were randomly distributed on the free cells. The shopkeepers were divided equally, 15 of each type, and there were 5 consumers of each type. Each consumer had 10 items in the list of items they wanted to buy. The simulation was run for 200 cycles. The performance of the consumer agent were measured by the following formula: ; where is the cycle number when the last purchase was made by the agent; this is done, of course, for each of the products bought. This means that the agent performance decreases as the simulation progresses (if no further purchases are made), and also decreases if the agent has been cheated by the shopkeepers. The performance of the shopkeeper agent is measured by the formula: . This means that the shopkeeper's performance is equal to the sum of all money it has accumulated plus the sum of the cost of the unsold products. Using those formulæ, the following results were obtained. The Consumer A agents had the worst performance: they had as average points. Consumers B had the best performance with an average of points (48% more than consumers A) and consumers C had an average of points. This can be explained by the fact that the consumer A agents have not searched sufficiently to find good products with good prices. Since they were the first to buy, they were cheated by the shopkeepers. The consumer B agents, used the experience of agents A to recognise the cheaters, and had the best performances. The consumer C agents did too much searching, and when they decided to buy, another agent might have already bought the products they wanted to buy, so they had to go after the second or third choice. On the shopkeeper's side, shopkeepers X had as average money units, while shopkeepers Y had money units, a difference of almost 26%. The shopkeeper Y agents (the ones that tried to cheat consumers) had the worse performance, because they sold only a few products, mostly for the consumer A agents. This example was aimed only at illustrating the use of the MAS-SOC approach. The agents' reasoning was defined using the AgentSpeak(L) language, which may be executed using the Jason interpreter, and the environment was defined using the ELMS language. The strength of the MAS-SOC platform is its fully-fledged implementation of the operational semantics of AgentSpeak(L). Its current weakness is the lack of built-in interaction frameworks (protocols) which would spare the programmer to manually define, implement, and check the correctness of the forms of interactions between agents. Supporting ontologies for such interaction frameworks is also currently missing, but there is ongoing research on that subject. Introducing such indispensable elements is our current plan regarding the immediate development of the platform. Concerning the MAS-SOC approach to social simulation, social organisations will be our immediate concern. We plan to adopt a role-based approach to social organisation (Demazeau 1996, Hübner 2002), where roles, norms, and values, together with negotiation protocols and strategies for solving conflicts, play a central role. That will demand the definition of which built-in social frameworks will be introduced in the platform to support such notions. Work on such social frameworks is already under way, focusing on the notions of exchange values (Rocha Costa 2005) and social control (Castelfranchi 2000). Whatever final social elements we choose to built into the platform, we will adopt the idea that social structures can be reified as concrete structures of a general environment, encompassing both the physical and the social structures that the agents have to deal with. This stance allows us to introduce the above mentioned social elements (norms, roles, values, etc.) as standard constructs of the ELMS language, on equal footing with the physical elements that the language already handles. We hope that, following this track, we will be able both to refine the sound social simulation foundations underlying our approach and to further elaborate the agent-programming platform that supports MAS-SOC. This work was partially supported by CNPq and FAPERGS. Rafael Bordini gratefully acknowledges the support of The Nuffield Foundation (grant number NAL/01065/G). 3For this reason, a workshop series (held with AAMAS) has recently been created for discussing issues related to multi-agent environments specifically (Weyns 2005). 4Part of the environment definition from the example shown in Section 8. 5Although the list of reactions is the same for all cells, this does not imply they all have the same behaviour at all times, as reactions can have preconditions on the specific state of the individual cells. 6Agents send a message with "true" as its content if they choose to not execute an action in that cycle. 9In fact, this refers to types of agent, as each of these agents definitions may various instances in a simulation. ANCONA D, Mascardi V, Hübner J F, and Bordini R H (2004) Coo-AgentSpeak: Cooperation in AgentSpeak through plan exchange. In Jennings, N. R., Sierra, C., Sonenberg, L. and Tambe, M., eds., Proceedings of the Third International Joint Conference on Autonomous Agents and Multi-Agent Systems (AAMAS-2004), New York, NY, 19-23 July, 698-705. New York, NY: ACM Press. BORDINI R H, and Moreira, Á F (2002) Proving the asymmetry thesis principles for a BDI agent-oriented programming language. In Dix, J., Leite, J. A. and Satoh, K., eds., Proceedings of the Third International Workshop on Computational Logic in Multi-Agent Systems (CLIMA-02), 1st August, Copenhagen, Denmark, Electronic Notes in Theoretical Computer Science 70(5). Elsevier. URL: <http://www.elsevier.nl/locate/entcs/volume70.html>. CLIMA-02 was held as part of FLoC-02. This paper was originally published in Datalogiske Skrifter number 93, Roskilde University, Denmark, pages 94-108. BORDINI R H, and Moreira Á F (2004) Proving BDI properties of agent-oriented programming languages: The asymmetry thesis principles in AgentSpeak(L). Annals of Mathematics and Artificial Intelligence 42(1-3):197-226. Special Issue on Computational Logic in Multi-Agent Systems. BORDINI R. H, Bazzan A L C, Jannone R O, Basso D M, Vicari R M, and Lesser V R (2002) AgentSpeak(XL): Efficient intention selection in BDI agents via decision-theoretic task scheduling. In Castelfranchi, C. and Johnson, W. L., eds., Proceedings of the First International Joint Conference on Autonomous Agents and Multi-Agent Systems (AAMAS-2002), 15-19 July, Bologna, Italy, 1294-1302. New York, NY: ACM Press. BORDINI R H, Fisher M, Pardavila C, and Wooldridge M (2003a) Model checking AgentSpeak. In Rosenschein, J. S., Sandholm, T., Wooldridge, M. and Yokoo, M., eds., Proceedings of the Second International Joint Conference on Autonomous Agents and Multi-Agent Systems (AAMAS-2003), Melbourne, Australia, 14-18 July, 409-416. New York, NY: ACM Press. BORDINI R H, Visser W, Fisher M, Pardavila C, and Wooldridge M (2003b) Model checking multi-agent programs with CASP. In Hunt Jr., W. A. and Somenzi, F., eds., Proceedgins of the Fifteenth Conference on Computer-Aided Verification (CAV-2003), Boulder, CO, 8-12 July, number 2725 in Lecture Notes in Computer Science, 110-113. Berlin: Springer-Verlag. Tool description. BORDINI R H, Okuyama F Y, de Oliveira D, Drehmer G, and Krafta R. C (2004a) The mas-soc approach to multi-agent based simulation. In Lindemann, G., Moldt, D. and Paolucci, M., eds., First International Workshop on Regulated Agent-Based Social Systems (RASTA 2002), held with AAMAS02, Bologna, Italy, 16 July (Revised Selected and Invited Papers), number 2934 in Lecture Notes In Artificial Intelligence. Berlin: Springer-Verlag. BORDINI R H, Dastani, M., Dix, J. and El Fallah-Seghrouchni, A., eds. (2004b) Proceedings of the Second International Workshop on "Programming Multi-Agent Systems: Languages and Tools" (ProMAS 2004). To appear in Springer's LNAI Series. BORDINI R H, Okuyama F Y, de Oliveira D, Drehmer G, and Krafta RC (2004c) The MAS-SOC approach to multi-agent based simulation. In Lindemann, G., Moldt, D. and Paolucci, M., eds., Proceedings of the First International Workshop on Regulated Agent-Based Social Systems: Theories and Applications (RASTA'02), 16 July, 2002, Bologna, Italy (held with AAMAS02) -- Revised Selected and Invited Papers, number 2934 in Lecture Notes in Artificial Intelligence, 70-91. Berlin: Springer-Verlag. BORDINI R H, Hübner J F et al. 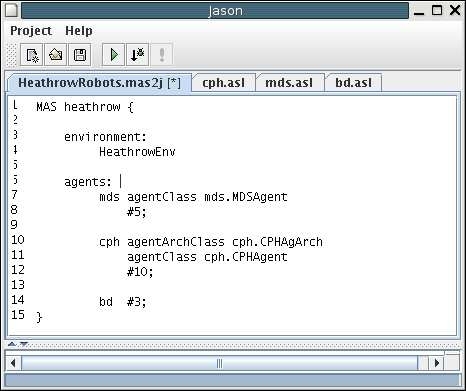 (2005) Jason: A Java-based AgentSpeak interpreter used with SACI for multi-agent distribution over the net, manual, version 0.6 edition. http://jason.sourceforge.net/. CALCIN O P, Okuyama F Y, and Dias A M (2004) Simulación del proceso de compra de artículos en un mercado virtual con agentes BDI. In Solar, M., Fernandez-Baca, D. and Cuadros-Vargas, E., eds., 30ma Conferencia Latinoamericana de Informática (CLEI2004), Sociedad Peruana de Computación, . September, 2004. ISBN 9972-9876-2-0. CASTELFRANCHI C (1998) Simulating with cognitive agents: The importance of cognitive emergence. In Sichman, J. S., Conte, R. and Gilbert, N., eds., Multi-Agent Systems and Agent-Based Simulation, number 1534 in Lecture Notes in Artificial Intelligence, 26-44. Berlin: Springer-Verlag. CASTELFRANCHI C (2000) Engineering social order. In Zambonelli F. Omicini A., Tolksdorf R., editor, Engineering Societies in the Agents World, pages 1 ñ 18. Springer, 2000. CASTELFRANCHI C (2001) The theory of social functions: Challenges for computational social science and multi-agent learning. Cognitive Systems Research 2(1):5-38. CONTE R, and Castelfranchi C (1995) Cognitive and Social Action. London: UCL Press. DASTANI M, Dix J, and Fallah-Seghrouchni, A E., eds. (2004) Programming Multi-Agent Systems, First International Workshop, PROMAS 2003, Melbourne, Australia, July 15, 2003, Selected Revised and Invited Papers, volume 3067 of Lecture Notes in Computer Science. Springer. DEMAZEAU Y, and Rocha Costa A C (1996) Populations and organizations in open multi-agent systems. In 1st National Symposium on Parallel and Distributed AI (PDAIí96), Hyderabad, India, 1996. FOSTER I, and Kesselman C, eds. (2003) The Grid 2: Blueprint for a New Computing Infrastructure. Morgan Kaufmann, second edition. HORROCKS I, and Patel-Schneider P F (2003) Reducing OWL entailment to description logic satisfiability. In Fensel, D., Sycara, K. and Mylopoulos, J., eds., Proc. of the 2003 International Semantic Web Conference (ISWC 2003), number 2870 in Lecture Notes in Computer Science, 17-29. Springer. HÜBNER J F, Sichman J S, and Boissier O (2002) OISE : Towards a structural, functional, and deontic model for MAS organization. In Proceedings of the First International Joint Conference on Autonomous Agents and Multi-Agent Systems (AAMAS'2002), Bologna, Italy. Extended Abstract. HÜBNER J F (2003) Um Modelo de Reorganização de Sistemas Multiagentes. Ph.D. Dissertation, Universidade de São Paulo, Escola Politécnica. KRAFTA R, de Oliveira D, and Bordini R H (2003) The city as object of human agency. In Fourth International Space Syntax Symposium (SSS4), London, 17-19 June, 33.1-33.18. LEITE J, Omicini A, Torroni P, and Yolum, P., eds. (2004a) Proceedings of the Second International Workshop on Declarative Agent Languages and Technologies (DALT 2004). To appear in Springer's LNAI Series. LEITE J, Omicini A, Sterling L, and Torroni, P., eds. (2004b) Declarative Agent Languages and Technologies, First International Workshop, DALT 2003, Melbourne, Australia, July 15, 2003, Revised Selected and Invited Papers, volume 2990 of Lecture Notes in Computer Science. Springer. MACHADO R, and Bordini R H (2002) Running AgentSpeak(L) agents on SIM_AGENT. In Meyer, J.-J. and Tambe, M., eds., Intelligent Agents VIII - Proceedings of the Eighth International Workshop on Agent Theories, Architectures, and Languages (ATAL-2001), August 1-3, 2001, Seattle, WA, number 2333 in Lecture Notes in Artificial Intelligence, 158-174. Berlin: Springer-Verlag. MOREIRA Á F, and Bordini R H (2002) An operational semantics for a BDI agent-oriented programming language. In Meyer, J.-J. C. and Wooldridge, M. J., eds., Proceedings of the Workshop on Logics for Agent-Based Systems (LABS-02), held in conjunction with the Eighth International Conference on Principles of Knowledge Representation and Reasoning (KR2002), April 22-25, Toulouse, France, 45-59. MOREIRA Á. F, Vieira R, and Bordini R. H (2004) Extending the operational semantics of a BDI agent-oriented programming language for introducing speech-act based communication. In Leite, J., Omicini, A., Sterling, L. and Torroni, P., eds., Declarative Agent Languages and Technologies, Proceedings of the First International Workshop (DALT-03), held with AAMAS-03, 15 July, 2003, Melbourne, Australia (Revised Selected and Invited Papers), number 2990 in Lecture Notes in Artificial Intelligence, 135-154. Berlin: Springer-Verlag. OKUYAMA F Y, Bordini R H, and Rocha Costa A C (2005) ELMS: An environment description language for multi-agent simulations. In Weyns, D., van Dyke Parunak, H. and Michel, F., eds., Proceedings of the First International Workshop on Environments for Multiagent Systems (E4MAS), held with AAMAS-04, 19th of July, 67-83, number 3374 in Lecture Notes In Artificial Intelligence, Berlin, 2005. Springer-Verlag. OKUYAMA F. Y. (2003) Descrição e geração de ambientes para simulações com sistemas multiagentes. MSc thesis, PPGC/UFRGS, Porto Alegre, RS. in Portuguese. PLOTKIN G D (1981) A structural approach to operational semantics. Technical report, Computer Science Department, Aarhus University, Aarhus. RAO A S, and Georgeff M P (1991) Modeling rational agents within a BDI-architecture. In Allen, J., Fikes, R. and Sandewall, E., eds., Proceedings of the 2nd International Conference on Principles of Knowledge Representation and Reasoning (KR'91), 473-484. Morgan Kaufmann publishers Inc.: San Mateo, CA, USA. RAO A S, and Georgeff M P (1995) BDI agents: From theory to practice. In Lesser, V. and Gasser, L., eds., Proceedings of the First International Conference on Multi-Agent Systems (ICMAS'95), 12-14 June, San Francisco, CA, 312-319. Menlo Park, CA: AAAI Press / MIT Press. RAO A S, and Georgeff M P (1998) Decision procedures for BDI logics. Journal of Logic and Computation 8(3):293-343. RAO A S (1996) AgentSpeak(L): BDI agents speak out in a logical computable language. In Van de Velde, W. and Perram, J., eds., Proceedings of the Seventh Workshop on Modelling Autonomous Agents in a Multi-Agent World (MAAMAW'96), 22-25 January, Eindhoven, The Netherlands, number 1038 in Lecture Notes in Artificial Intelligence, 42-55. London: Springer-Verlag. ROCHA COSTA A C, Dimuro G P, and Palazzo L A M (2005) Systems of exchange values as tools for multi-agent organizations. Journal of the Brazilian Computer Society, 2005. (To appear, available at http://gmc.ucpel.tche.br/valores.). RODRIGUES M R, Rocha Costa A C, and Bordini R H (2003) A system of exchange values to support social interactions in artificial societies. In Rosenschein, J. S., Sandholm, T., Michael, W. and Yokoo, M., eds., Proceedings of the Second International Joint Conference on Autonomous Agents and Multi-Agent Systems (AAMAS-2003), Melbourne, Australia, 14-18 July, 81-88. New York, NY: ACM Press. RUSSEL S, and Norvig P (2003) Artificial Intelligence - A Modern Approach. Englewood Cliffs: Prentice-Hall. SHOHAM Y (1993) Agent-oriented programming. Artificial Intelligence 60:51-92. SINGH M P, Rao A S, and Georgeff M P (1999) Formal methods in DAI: Logic-based representation and reasoning. In Weiß, G., ed., Multiagent Systems--A Modern Approach to Distributed Artificial Intelligence. Cambridge, MA: MIT Press. chapter 8, 331-376. STAAB S, and Studer R, eds. (2004) Handbook on Ontologies. International Handbooks on Information Systems. Springer. VIEIRA R, Moreira ¡ F, Wooldridge M, and Bordini, R H (2005) On the formal semantics of speech-act based communication in an agent-oriented programming language. Submitted article, to appear. WEYNS D, van Dyke Parunak H, and Michel F, eds. (2005) Proceedings of the First International Workshop on Environments for Multiagent Systems (E4MAS), held with AAMAS-04, 19th of July, New York City, NY. Number 3374 in LNAI. Springer-Verlag. WOOLDRIDGE M (2000) Reasoning about Rational Agents. Cambridge, MA: The MIT Press.